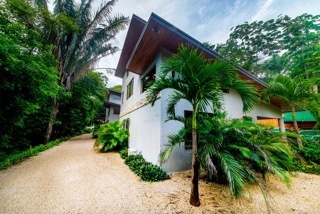 Nosara Verde is an artfully designed vacation oasis ideally located on a quiet street a walk to Guiones beach, a variety of restaurants, entertainment, surf shops, ice cream and more. 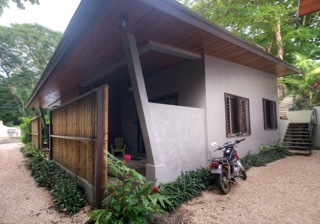 Our property boasts new, comfortable, tastefully built homes and bungalows to suite your style and needs. Our lagoon like saltwater pool is located in the center of the property perched upon a hill for optimum privacy, relaxation and breeze. The luxiorous pool is surrounded by lush landscaping. Our large trees allow for daily visits from monkeys, various bird species, iguanas and an array of animals you will see for the first time. Relax under a tree in the hammock or in any of our shaded areas in a comfy lounge chair. You will find yourself relaxing pool-side both day and night, enjoying the sound of the waves, the bright stars at night. 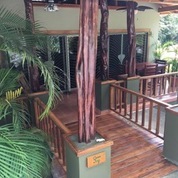 Book with us and discover what the PURA VIDA is all about!